Whether you are a hunter, bird watcher, or other viewing hobbyists, it pays to have a quality pair of binoculars around to make sure you do not miss a thing. Of course, that does not mean you want to pay out the nose if you do not have to. That is why we have scoured the web to assist in your search for the best pair of binoculars under $100. The great listing of best products we could find, you will have no trouble finding the pair that is right for you. SCOKC is not an especially established brand in the binoculars market with only two offerings–though both products appear on this list. While they may not be well-known, SCOKC manages to produce a solid product at the extreme ends of the binocular market for distance and compactness. The first SCOKC is the distance binoculars, and it does this job admirably with a few caveats. It sports a 10×30 natural magnification with the ability to zoom up to 10×50. This produces a wide-angle view that is only heightened by the 5.mm exit pupil. Unfortunately, the SCOKC’s zoom feature has a tendency to muddy the clarity, an effect which is especially apparent at the edges of the image. The zoom also restricts the light, making the image darker. The Wingspan provides a solid value with a couple features that are surprising on a model at this price point. The Bak4 prisms are excellent for image clarity and not as common in the smaller profile budget binoculars. The lifetime warranty is a nice touch and shows a confidence from the company for their product. Keep in mind, these binoculars do come with limitations. Even though their profile may be smaller, their weight of over a pound is heavy for compact binoculars. Moreover, the optics are okay, but not great. While the 8x magnification is fairly common, the 40mm objective lens is definitely on the small side. There is so much to like about these binoculars, but some of their limitations place them in an extremely narrow niche in the market. Still, for the price they are a great value. The optics of the G4Free are great. A 12x magnification is better than most of the products on this list, and the Bak4 prisms are as good as it gets. Its compact size makes them easy to store on the go and take pretty much anywhere. Unfortunately, the size has apparently impacted the design as the 25mm objective lens creates a small window for the image. To make matters worse, the 2.08 exit pupil will not work well in low-light conditions and create a peephole effect. This would be okay, but at almost 1 pound, these are dense and heavier than expected. The Merytes are not a spectacular pair of binoculars and are not even as good in the optics department as the previous entries on this list. However, they do provide something that the others do not: a better price point. So long as you are comfortable with a pair of binoculars better suited for amateurs, the Merytes should be sufficient. As a pair of travel binoculars, their weight is impressive at less than one-half a pound. Unfortunately, when producing a value based item, something has to give. With the Merytes, that something is optics. The 25mm objective lens suffers the same issues as the G4Free, but a lack of Bak-4 prisms do not compensate. As such, the edges of the image is fuzzy. The Educational Insights GeoSafari Compass Binoculars made on this list for one reason and one reason alone: they are a solid value for children who are interested in pursuing a hobby that requires binoculars. Adult hobbyists, even beginners, are advised to invest a little bit more and get a much better pair with superior features. 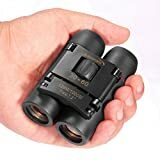 However, for children who may still be learning how to take care of their possessions, these binoculars allow them to experiment with optical hobbies without the worry of wasting money on broken equipment. The magnification is only 4x, so these binoculars have the lowest magnification of any on this list. The compass, while nifty, is little more than a distraction and not really meaningful in terms of the binoculars. The first Celestron on our list has some things it does fairly well and some it could definitely stand to improve on. This is in stark contrast with the only other Celestron which captures our top pick. Of course, the other Celestron is also twice as expensive as this pair. With a 50mm and 7.1mm exit pupil, these may be the best binoculars on the list for low-light conditions. Unfortunately, the prism is only a BK7, so the clarity will not be as sharp as it could. One issue with the Cometrons involves the parallax which has been noted as finicky and needing regular realignment. Still, the housing itself is stable and can take a beating, but the internal components will not fare so well. Olympus is known for producing a number of high-quality optical products. While the Troopers are not poor quality, they do not really live up to the standards you might expect from a brand with the great reputation that Olympus has. There is nothing really wrong with the Troopers, but neither do they excel in any meaningful way either. They provide a middle of the road value with adequate features and product qualities but are a bit on the higher end of the price for this list. The 50mm objective lenses and 5mm exit pupils are solid in low-light, though there are others that are better for low-light conditions. The BK7 prisms and UV-protective film are okay, but again, there are other options that are better. This pair of binoculars is the second pair of Merytes on the list as is remarkably similar to the previous pair. Much like the other pair of Merytes, the primary draw for these is the value. One thing that distinguishes these from the other pair are the objective lenses which are half the size. At 25mm, these objective lenses may produce a more narrow image, but are more in line with the quality of the lenses and prisms. This prevents the fuzziness and light artifacts from afflicting this pair of Merytes binoculars as much as it did the other. Still, one good thing both Meryteses have in common is their size and weight which is incredibly compact and light. Bushnell is a well-known and well-respected brand in the binocular market and this product keeps in line with expectations. However, this pair of binoculars is definitely designed for a specific use, and that needs to be considered before purchase. One of the best features of this pair of binoculars is its fogproofing. 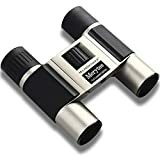 This prevents any moisture from getting into the binoculars and makes them ideal for less-than-perfect weather conditions. The optics, however, are a bit mixed. The Bushnell’s do come with Bak-4 prisms for solid clarity, but the 25mm objective lenses limit your ability to search with them. This is further compounded by a 12mm eye relief which is a bit much for such a small profile. Essentially, you will need to know where your subject is and be somewhat familiar with binocular use beforehand. The Polaris Spectators do a number of things exceptionally well that make them a versatile pair of binoculars that can be used for a variety of purposes. However, they do still have their limits. First, the field of view is amazing for such a compact pair of binoculars with a 6.9 aov. Still, it would be preferable if they were not so heavy. This can make them a bit difficult and awkward to use for long periods of time. Another advantage not seen on many binoculars is the excellent close focus which, while not professional, is great at this price point. Combine that with Bak-4 prisms, and you have a pair of binoculars that are effective at all ranges. The second Celestron on our list improves on the first while still keeping the best features. However, it also comes a greater cost which somewhat limits its maximum value. Unlike the previous Celestron, the Outland comes with much improved optics sporting Bak-4 prisms for clear and well-contrasted images. Moreover, the lenses are fully multi-coated to sharpen the image further. Unfortunately, these binoculars are a bit on the heavy side. 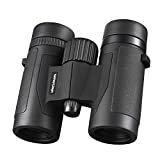 Combine that with a relatively small angle of view and they are better suited for users with experience using binoculars. And while the fogproofing allows you to take them pretty much anywhere, advanced users may want to opt for a truly professional pair of binoculars–though, those will generally cost over the $100 limit of this list. Aurosports captures the top compact binoculars spot of the list, though you should beware of some of its limitations. As an incredibly small pair of binoculars, you can take them with you on the go while also using them for hours on end without fatigue. Unfortunately, their small size and weight is kept intact by a plastic housing and mechanism which is prone to break if you are not careful and deliberate with their use. This means first-time hobbyists should probably find a more durable pair. However, for those who are careful, the optics are astounding. The 7.2 aov combined with Bak-4 prisms provides a clear and wide image that one would not expect from such a compact profile. Oddly, the Aurosports advertises an objective lens size that is simply untrue and not even realistically possible given the actual binocular’s dimensions. The second of three Bushnells and the first in the Falcon series, the 133450s keep in line with the quality expected, though it does cut some odd corners. Whereas the H2Os were specialized for wet climates, these are more general purpose. As such, do not expect any waterproofing and foggy conditions can have long-term consequences. An odd omission with this pair of binoculars comes in the prism. Where the H20s use Bak-4s, the 133450s only use BK7s. This means the image is not quite as clear nor the contrast as sharp. Still, the 50mm objective lens makes finding and tracking your subject easy while the 5mm exit pupil allows you to do so even in low-light conditions. The auto-focus lever is great, but also necessary, as these binoculars weigh more than one and a half pounds. The final pair of Bushnells and second Falcon is a bit of a middle ground between the two previous entries. In fact, the three pairs are more appropriately understood as having distinct niche uses and being solid within that realm. Like the previous Falcons, the 133410s have a 5mm exit pupil, making them excellent in low-light conditions. Unfortunately, the objective lens is only 35mm, which is better than the H20s but not as good as the 133450s. One advantage this pair has over the other falcons is that lenses are fully multi-coated. This makes the image clearer and contrast better, even if this Falcon also has the BK7 prisms instead of the superior Bak-4s. It may seem a bit odd that our number pick is somewhat niche, but for the value it offers, you cannot ignore the quality. Our final Celestron takes the best qualities of the previous models and improves on them in a number of ways. First, these are exclusively long-distance binoculars. Do not use these if you need to switch between long and short viewing distances. That said, for long-distance binoculars, they are nearly as good as pairs more than twice as expensive. With a 70mm objective lens and Bak-4 prisms, the SkyMaster produces clear images with an amazing width of view. 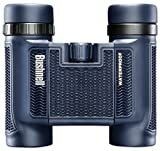 Combine that with a 15x magnification and a 5.0mm exit pupil, and these binoculars are pretty much ideal for stargazing. Keep in mind, you would do best to invest in a tripod as they are rather large and heavy. Also, it would be nice if the lenses were fully multi-coated, but for stargazing purposes, simply being multi-coated is sufficient. One of the most important factors to determine when buying a pair of binoculars is the magnification and objective lens. These two qualities are represented by the two numbers generally accompanied with the product. For example, a 10×42 pair of binoculars will magnify the image by 10 times and have an objective lens of 42mm. Lenses are also important and the more coated they are the better. The exit pupil size will factor in their effectiveness in low-light conditions while their field of view determines the amount of horizontal distance captured by the optics. While the Celestron SkyMaster has room to improve, at its price point it compares favorably to even professional grade binoculars. Granted, it does not produce as refined an image at all distances, but it is still able to produce a professional grade optic where you need it. With an extensive 15x magnification and a 70mm objective lens, these are ideal binoculars to use for long-distances. The industry best Bak-4 prisms and multi-coated lenses combine to provide crisp, clear images. Keep in mind, if you plan on using the Celestron SkyMasters for an extended period of time, it would be in your best interest to get a tripod for them as they are rather heavy. Also, the angle of view is narrow and the minimum focus distance is long, so you are somewhat limited to distance viewing with these binoculars. Still, as the only standard “Giant” class binoculars on the list, the Celestron Skymaster is an amazing value at less than half the price of most of its competitors. That is why we have named the Celestron SkyMaster as the best binoculars under $100.